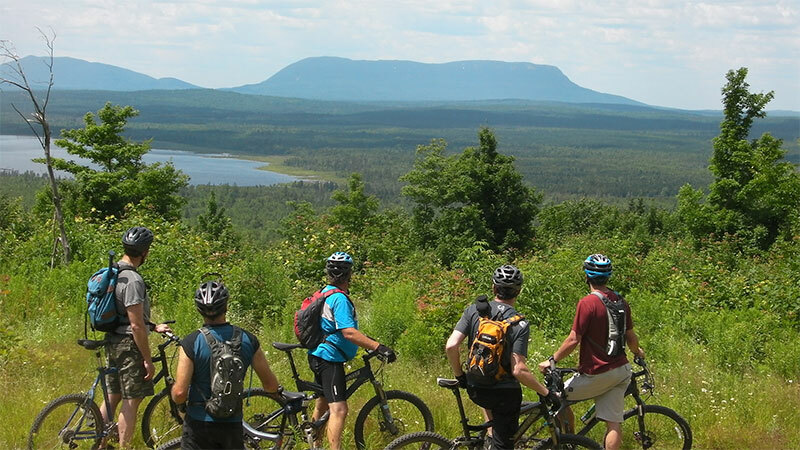 Located in the northeastern most corner of America, Maine is a mesmerizing state that consistently draws millions of tourists each year, including a sizable contingent of outdoor recreation enthusiasts looking to tackle its many exciting and scenic mountain bike trails. Bordered by New Hampshire, the Atlantic Ocean and the Canadian provinces of Quebec and New Brunswick, Maine is famous for its many different types of terrains, including its serrated, rocky coastline; low, undulating mountains; deeply forested interior; and charming waterways, all of which host an array of biking trails that are sure to challenge every level of rider within your group. For those of you that live in, or are planning to travel to Maine for a little outdoor excitement, below we have highlighted a small sample (5) of the trails you are likely to encounter there, complete with an in-depth description of each of those courses. Located in the small town of Pownal, Maine, Bradbury Mountain State Park is one of Maine’s five original state parks—a park that offers 18 miles of trails, each featuring a wide variety of unique challenges. The park’s Northern Loop Trail boasts a wide gradual ascent to the summit of Bradbury Mountain, upon which riders will pass an old feldspar quarry that was active during the 1920s; and the downhill Terrace Trail, spanning just .3 miles in length, features a speedy descent along the base of the Northern Bluff that was once cultivated for wine grapes. The less-traveled South Ridge Trail provides panoramic views of the southern valley—a narrow trail that hosts a number of obstacles, including stair-like terrain, berms, roots and soft sand. Finally, the popular Boundary Trail is a challenging 1.5 mile course with a series of steep descents over rock ledges. This trail will connect to the soon-to-be-opened courses leading to the Pineland Public Reserve Lands, and features a massive vernal pool running alongside the trail, where riders are treated to a serenade of springtime sounds, among them the mating calls of frogs and salamanders performing their annual ritual. Located in the town of Gray, Maine, the Libby Hill Forest Trails offer courses for all types of riders. The level of difficulty with regard to this trail system depends largely on the course riders opt to explore, as each is geared to different ability levels. Libby Hill features both wide and narrow multi-purpose trails that take riders through varied terrain and ecosystems, including forest uplands, wetlands, beaver areas and even an 1800s-era farmstead. Its network of trails features multiple loop options, including four single-track trails, known as Lynx, Harold Libby, Ghost and Outback. These trails offer the most terrain diversity and habitat variance while traversing through glacial eskers and across a stream into active beaver and moose habitat. Rated as moderately difficult with several steep areas, these single-track courses are the most remote of all the trails at the park and thus offer the widest variety of local flora and fauna. Libby Hill also features some wider double-track trails—Turkey Trot, Moose Odyssey, Deer Run, Holmquist Hollow—that offer easy to moderate biking for beginner to intermediate riders and families. The terrain along these courses is mostly forested and gently rolling to hilly, with one of the trails, Holmquist Hollow, being very steep and challenging. The perfect course for those new to the sport of mountain biking, the trail system at Clifford Park, located in the town of Biddeford, Maine, is a great place for riders to learn and perfect a wide array of all-important bike handling skills. The Clifford Park In-Town Loop, as the course is known, is a 3 mile loop trail that features a waterfall and some easy to moderate obstacles. The trail is primarily used for hiking, mountain biking & snowshoeing and is accessible year-round. Located in the heart of Biddeford, the Clifford Park system of trails is extremely popular with the town’s local riders. The course is set against a gorgeous backdrop of breathtaking fauna and cityscapes, making it the ideal destination for sightseeing and communing with nature. One of Maine’s most popular mountain biking venues among the state’s local outdoor enthusiasts, the Carrabassett Valley Trail System, located in the town of the same name, is a cant’s miss stop for riders of all ages and ability levels. Rated “intermediate” overall by the area’s local cycling club, this system of trails has a little bit of everything: wide double track; twisty, downhill single track; and an abundance of picturesque scenery that will have riders reaching for their camera phones. The Carrabassett Valley Trail System has a number of different courses, including Round the Pond, Speed Up Flow Down, and the Hut-to-Hut Loop. Round the Pond is a 20-30 minute beginner course that starts and ends at the Sugarloaf Outdoor Center. This introductory ride is ideal for those new to the sport—those who are just getting the feel of a mountain bike. The course circumnavigates the pond at the Outdoor Center, has very little climbing, and offers a smooth terrain and some great scenic vistas. Speed Up, Flow Down is a 45-60 minute ride intended for intermediate riders. This fun loop, which also commences and ends at the Sugarloaf Outdoor Center, not only tests riders’ bike handling skills but also gives them a major cardio boost during the uphill sections of the course and some thrilling excitement as they make their way back down. Finally, the course known as the Hut-to-Hut Loop is an advanced track that starts and finishes at the Huston Brook Trailhead. This figure eight loop trail takes riders over challenging terrain though two of the Maine Huts & Trails backcountry huts. These facilities, which are a unique aspect of biking in the Carrabassett Valley region, serve snacks and beverages through much of the season and offer a place to rest and refill water containers. Situated in the city of Lebanon, Maine, Salmon Falls Preserve is an exciting locale that boasts an eight-mile trail loop through mixed woodlands and down to the shores of the Salmon Falls River. In addition to the fun and challenges of the course itself, the trail offers beautiful views of an old dam and mill property in New Hampshire. According to locals, portions of the trail could be hazardous to young children and dogs because of its steep ledge. The Salmons Fall Preserve runs approximately 400 feet from Prospect Hill Road just south of the cemetery, at which point it opens up to a mostly hardwood forest. This terrain offers riders a number of unique challenges, including switchbacks, roots and drop-offs. Along the Salmon Falls River, riders will navigate through a series of coniferous trees, mostly hemlocks, before traversing up the hill to the course’s starting point. The Salmon Falls Preserve and trail are managed by volunteers from the Three Rivers Land Trust.